One of the largest assets many people have each year is their state and federal tax refunds. For some, it is a few hundred dollars. For others, it can be thousands of dollars even as much as $10,000. When considering filing bankruptcy in Virginia this asset is generally the most valuable easy-to-liquidate asset a person has. Protecting it is always an important concern of a bankruptcy attorney and his/her client. While this extra surge of money annually can help people keep their financial head above water, it seldom is enough to change the winds of their financial success or lack of. So the question they are faced with when contemplating bankruptcy is, “How will my bankruptcy attorney protect this very important asset?” This question I will answer momentarily. Why Tax Refunds Are So Important To Families. For these people their annual tax refund means purchasing or paying for necessities they have otherwise put off. These necessities can be groceries, utilities, etc. For others, their refund may be used for long deferred vacations, household items and clothing. For many, this surge of cash once annually is the only way the make it through the year. Throwing this money at delinquent debt and bad credit seldom makes sense and rarely will change the financial fortunes of these families. When To Start Worrying About Your Refund. You may think that the only time that you have to concern yourself about your tax refund is every February to April when most people receive their tax refund. Wrong! If you received a large refund, being more than $1,000, you need to concern yourself about protecting the refund all year long. Why you ask? In the eyes of your Virginia bankruptcy trustee, you are accumulating credit towards your next year tax refund every month by over paying you tax obligation. In other words, if you are to receive a $2,400 tax refund in 2014 for taxes paid in 2013, you would be accumulating credit for this refund at a rate of $200 per month in 2013 ($2,400 / 12 = $200). So why do you have to protect something you don’t have yet? Except in cases of extremely large refunds, from January to April the bankruptcy trustee is only concerned about the refund being received that year. In general, starting in May until the end of the year the trustee uses the past refund amount to calculate your expected refund for the coming year. Calculations And Protection Differ In Chapter 7 And Chapter 13. In a Chapter 13, protection of your tax refund is less of a concern. This is because your tax refund is actually recalculated back into your estimated monthly income. The calculation permitted in a Chapter 13 is $xxxx refund minus $1,000 divided by 12 equals the monthly amount of refund applied to your monthly income. The theory behind this calculation is that if you adjusted your withholdings on you W-2 you would have this amount in your net income each month available towards your Chapter 13 plan payment. fund In A Chapter 7 in Virginia. 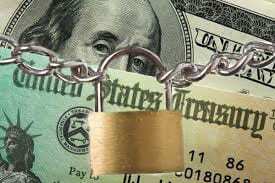 There are several strategies and legal exemptions to protect tax refunds that can be employed. Adjust Your Withholdings – In a case where a refund is large and there is insufficient protection available for your tax refund you can reduce your withholdings to have the money in your paycheck each pay cycle. This will reduce the size of your refund the coming year, and, as a result, the need for protection. Receive & Spend The Refund- If you are filing during tax refund season you always have the ability to delay your filing until after the refund has been received and…. spent. With the funds gone protection is not an issue. There are several restrictions on how your spend the funds. Do not pay back friends or relatives. This does not insure that the money cannot be captured by the trustee. Expenses that will not be questioned are those that would be considered “reasonable and necessary”. I know… that is very ambiguous. Just use your common sense. Also, if you opt to spend or spend down your refund keep detailed records of what is received and where it is spent. Also remember, if you are under threat of a garnishment of your bank account it is not wise to have your tax refund directly deposited into a back account via e-filing. Talk to your attorney about the timing of filing your bankruptcy and protection of your tax refund. Other Strategies – Exemption planning or asset protection is a complicated process. When you risk losing thousands of dollars of money or property the need for an attorney is greater. Unfortunately, bankruptcy filers that do not use an attorney and opt to file by themselves or with the assistance of a person claiming to be a “paralegal” lose assets too often. Use an attorney. Use one that offers a free consultation and payment plans to file your case. By the time you realize you have unprotected assets, it is often too late to save them. Be smart. A good bankruptcy attorney is worth the fee you pay him. It might be several years until you are sitting in your new house and driving your new car before you realized what a great job we did for you. But that day will come. If you have found this article helpful I would appreciate if you would “Google +1” the page at the top. Disclaimer: None of this information is given for the purpose of encouraging readers to pursue self-help or file without an attorney. Anyone considering a bankruptcy should used a qualified bankruptcy attorney to ensure their case is approved and that they do not lose any assets. This information only applies to bankruptcies filed in Virginia.